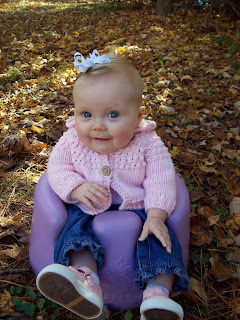 The Arbuckle Family Blog: Can it get more beautiful outside? Can it get more beautiful outside? 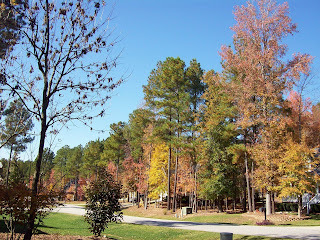 One thing I love about North Carolina is the seasons. I especially love Fall and Spring here. The weather today is in the seventies, sunny with a light breeze. I went to walk Toby on Saturday and it was so beautiful I didn't want to go back inside. I told Justin how amazing it was outside and we decided to take Kate and Toby (our dog) for a walk. There is this great trail right across from our house. I am sorry to say that I had never been on it until Saturday. It was so beautiful that I took pictures and I wanted to share them with you, but something is wrong with my memory stick so the pictures I wanted to post are lost. 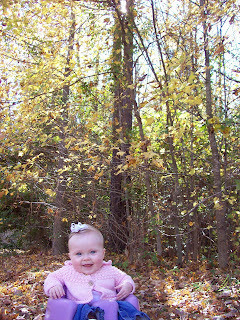 I decided to take Kate out today and take her picture by some of our beautiful trees and the entrance to our neighborhood. These pictures don't do it justice. It is so beautiful around here. 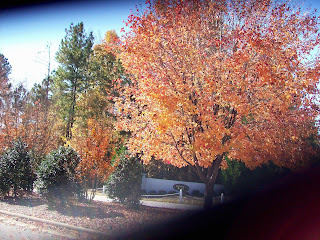 Thinking of the seasons reminded me of an old Nichole Nordeman Song, "Every Season". She compared how God works in our lives to each season. She sings, "So it is with You and how You make me new with every season's change, and so it will be, as you are recreating me, Summer, Autumn, Winter, Spring." Psalm 33:4-5 "For the word of the LORD is right and true; he is faithful in all he does. The LORD loves righteousness and justice; the earth is full of his unfailing love." I have posted a little video with the song below.